the problem method to teach legal reasoning andlawyeringskills. 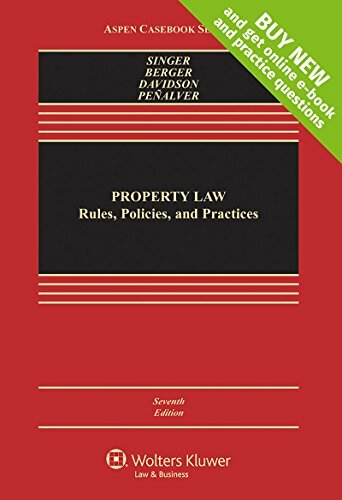 Thoroughly updated to reflect significant changes in the law of property, the Seventh Edition incorporates multiple new Supreme Court cases, including:Texas Department of Housing & Community Affairs v. Inclusive Communities Project, Inc.,Obergefellv. Hodges, andReed v. Town of Gilbert, and 3 decided or pending cases with implications for regulatory takings,Horne v.Dep’tof Agriculture,Marvin M. Brandt Revocable Trust v. United States, andMurrv. State. three decided or pending cases with implications for regulatory takings,Horne v.Dep’tof Agriculture, 135 S. Ct. 2419 (2015),Marvin M. Brandt Revocable Trust v. United States, 134 S. Ct. 1257 (2014), andMurrv. State, 359Wis.2d675 (Wis. Ct. App. 2014), cert. granted sub nom.Murrv. Wisconsin, 136 S.Ct. 890 (2016).